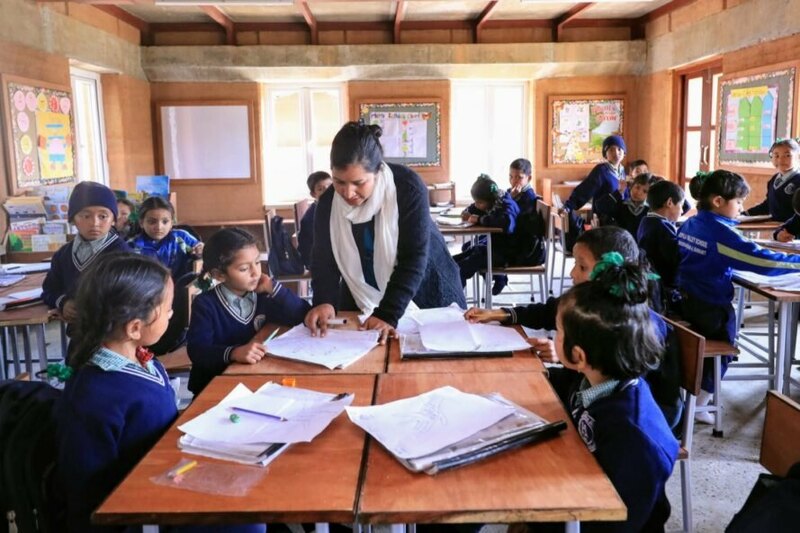 Located on three acres of land, the recently opened Kopila Valley School serves more than 400 students from nursery through 12th grade. The campus was built to expand on the nonprofit’s existing primary school and create a safe and nurturing environment that is not only a place of learning (with school uniforms and books provided), but also offers children nutritious meals, basic medical and dental care and after-school activities, such as sports and cooking classes. The school employs more than 100 Nepalese teachers and administrators. 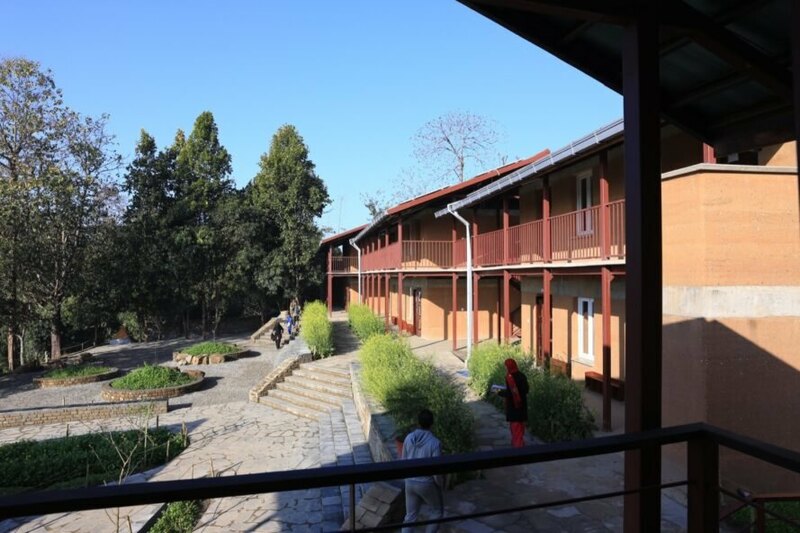 The campus also includes a Mental Health and Counseling Center, the Kopila Valley Health Clinic, a tutoring room, a computer lab, a stage and a small library. Sustainability is at the forefront of the campus design. 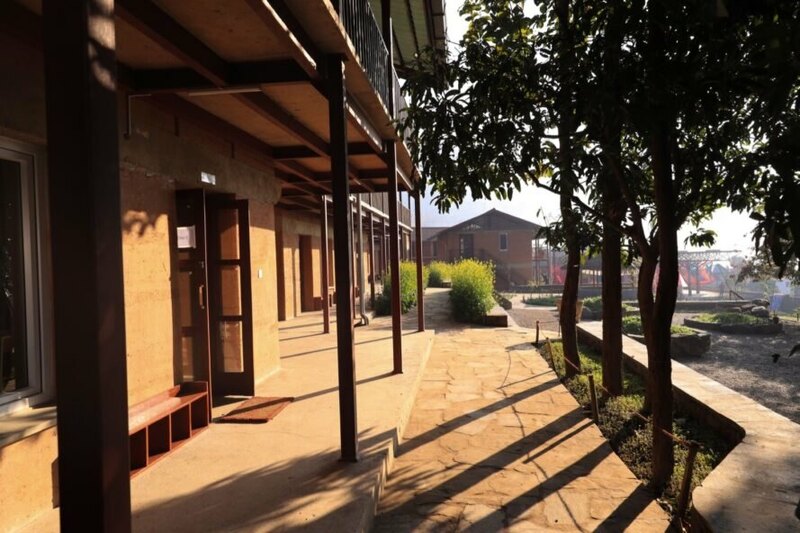 Locally sourced rammed earth, chosen for superior thermal mass and temperature control, was used to construct the 18-inch-thick walls reinforced with steel bars for stability and earthquake resilience and a small amount of PPC cement to protect against dampness during monsoon season. Natural ventilation and lighting were also optimized in the positioning of the buildings and windows, while covered terraces at southern-facing walls provide shade. The campus is 100 percent solar-powered with a 25.2 kWp solar PV system and a 20 kVA off-grid battery system. A 300,000-liter underground cistern stores rainwater harvested from the rooftops that is filtered for potable use. The landscaping and permeable paving ensure rainwater is also used to replenish the groundwater system. All wastewater is treated on site with constructed wetlands and then recycled. Gray water from sinks is used to flush the toilets; black water is filtered for plant irrigation; solids are converted in a pressurized tank into biogas fuel for cooking. Solar cookers are also used for cooking. 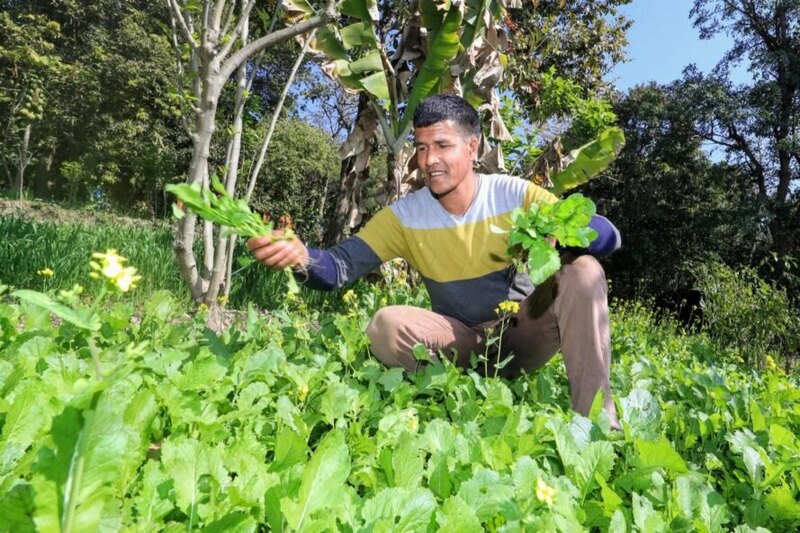 The Kopila Valley School is billed as "the greenest school in Nepal." The project was initiated by nonprofit BlinkNow. The access to education saves many students from malnourishment, early marriage, HIV, maternal death and suicide. The school employs more than 100 local teachers and administrators. 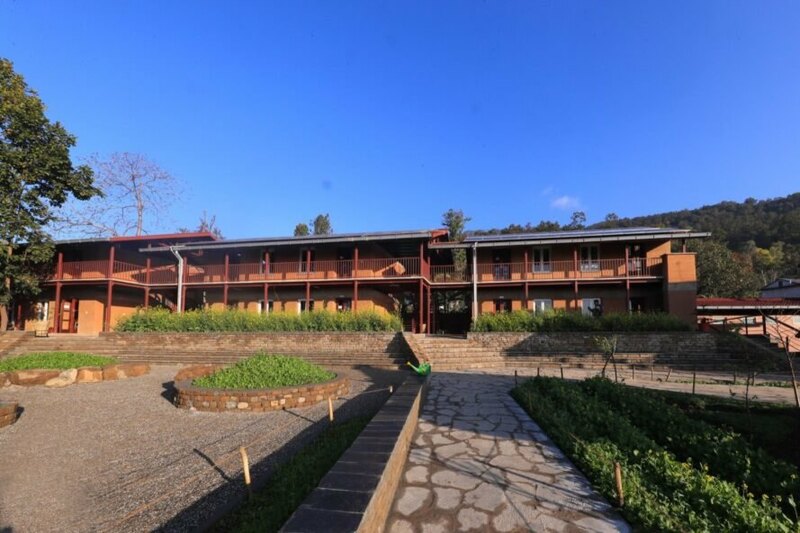 The school uses rammed earth construction for its superior thermal mass and temperature control. Student well-being is a priority. Healthcare is provided, as well as uniforms, books, nutritious meals and after-school activities. The school offers students fresh, healthy foods. Natural ventilation and lighting are emphasized in the design. 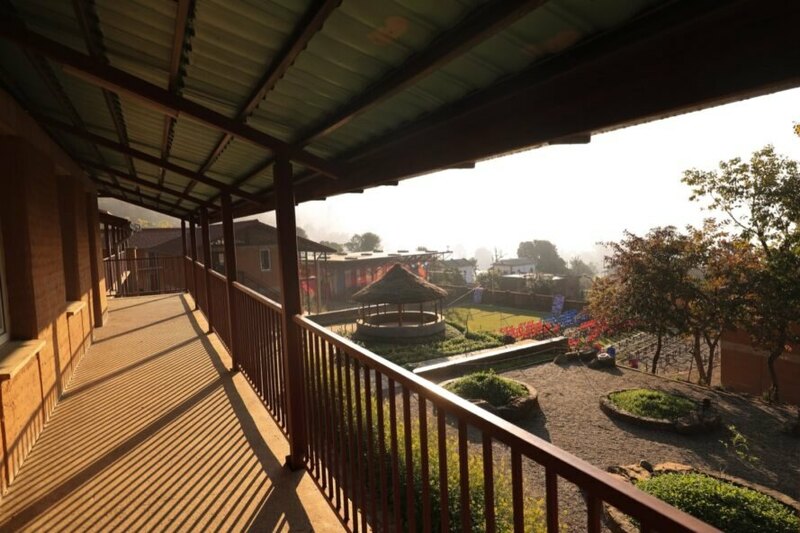 The campus includes a Mental Health and Counseling Center, the Kopila Valley Health Clinic, a tutoring room, a computer lab, a stage and a small library. There is plenty of outdoor space for the students and staff to enjoy. Passive design features keep the building comfortable. The school will inspire generations of students to pursue sustainable living and a love of learning.